If you are looking for new ways to cook potatoes, this is a tasty mashed potato recipe with sausages and sauerkraut that may be one to try. It was originally submitted to Cookingnook.com by Marja from Quebec,Canada. Boil the potatoes and sauerkraut together. In the meantime, fry your onions and bacon. In a separate frying pan, fry your sausages. When the sauerkraut and potatoes are done, mash them together with some butter and milk. Add the onions and bacon and stir until it is a nice smooth consistency. Put this mixture in a casserole dish or other serving dish. 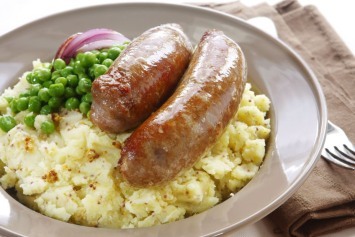 Then you have an option, to either slice the sausages on top of the casserole or serve them separately. Fine more delicious ways to cook potatoes here.